In the previous article (Database Creation using Create Database command), I explained the database creation using the Create database command. 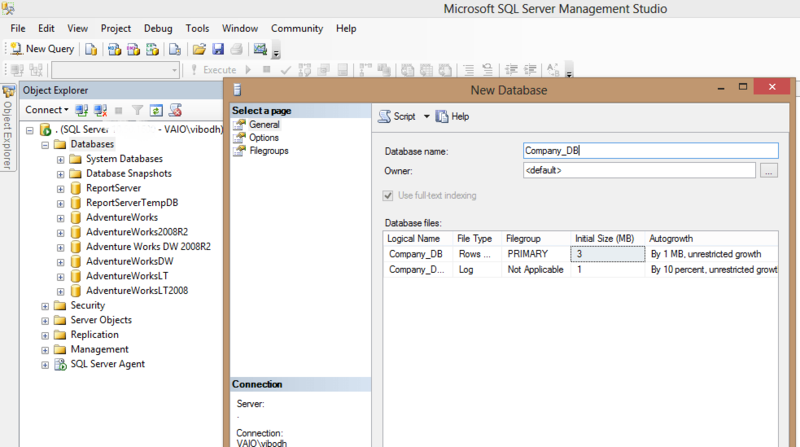 In this article, I am going to explain the steps of creation a database using SQL Sever Management Studio (SSMS) using SQL Server 2008 R2. These below database creation steps will be same for SQLServer 2005 and onward. Please note:- Above path can be changed depending on the Window version. 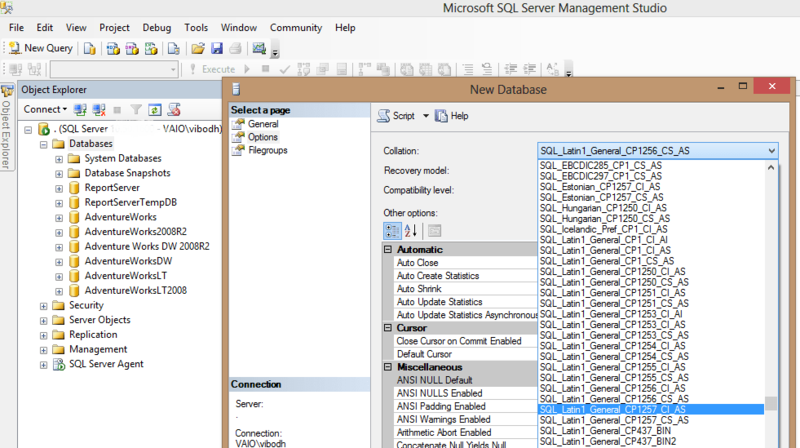 Step2:- Once SQL Sever Management Studio is opened, opened the Object Explorer. By default, it will be already opened. If it is not opened, then follow the below steps to open it. 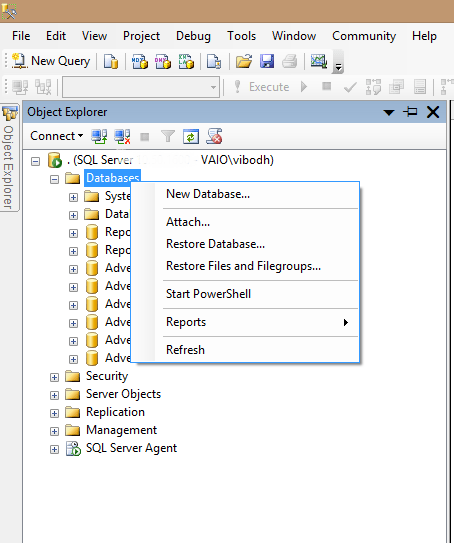 Step 3:- On the click of New Database option, New Database window is opened. In this window, we need to provide the database name and let the other values as default. (As shown in the below figure). Since we are creating the database Company_DB, we specify the name Company_DB as the Database name. In this window, we can choose the owner of the database, Path, Initial size, File growth, maximum size for the Data file and the Log file. In this article, let them as default. 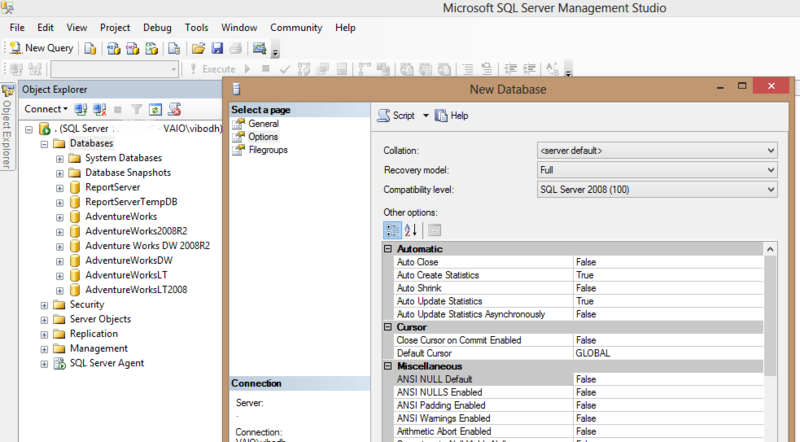 Step 4:- In the “New Database” window, click on the left hand side Options link. It will open the below screen. In this screen, we can choose the database collation, Recovery Model and Compatibility level. Also there are many other options under the heading Other options, which we can change according to our need. But for creating a simple database, we can let these options has the default values. After that, Click on the OK button below to complete the database creation process. You can see the newly created database Company_DB under the main node Databases.